With the recent release of an update on this year's measles outbreaks from the CDC, I thought this would be a good opportunity to write an open letter to all those anti-vaccine activists out there that have made the 20-year record number of measles cases so far this year possible. So here it is. To all of you out there who claim that vaccines are bad, that they cause autism, autoimmune disorders, asthma, and all manner of other maladies, thank you. To those of you who say that vaccines don't actually work or that the diseases prevented by vaccines really aren't that bad, thank you. To those of you who put yourself above everyone around you, who think only of your freedom and don't give a s*** about your family's, friends' or neighbors' health, thank you. To those of you who use religion as a cop-out, to hide behind your religion so you don't have to protect yourself, your children or those around you, thank you. Thank you for contributing to an environment of fear about vaccines. Thank you for spreading misinformation, uncertainty and doubt about vaccines. Thank you for creating regions perfect for the spread of disease. Without you, we wouldn't have been able to reach an amazing 307 cases and counting in the first five months of this year. 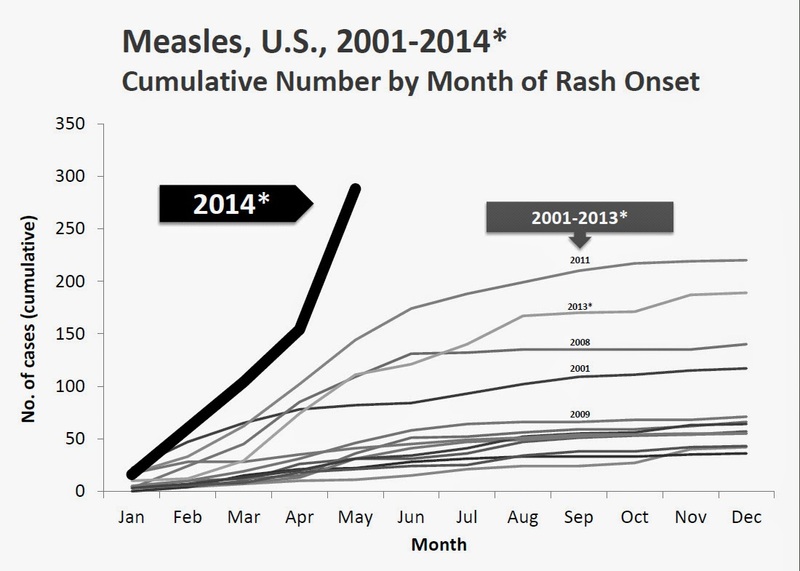 That's higher than any other year's total number of cases since measles was eliminated from endemic transmission back in 2000. And we haven't seen so many cases so quickly since 1994. Man. Just look at that steep, steep line for 2014, towering over every other year in the past fourteen years. Take a bow, anti-vaxers, because that is largely your work. Know how I know it's in large part due to your work? Here's how: 200 of the 288 reported in the CDC's media release about the outbreaks were completely unvaccinated, and 58 had unknown vaccination status. And those unvaccinated folks? Ten were too young to have been vaccinated, but would have been protected by herd immunity if not for you. Eleven had missed vaccination opportunities. Again, they would likely have been protected if you hadn't done such a bang-up job jeopardizing public health. The rest of the unvaccinated were unvaccinated because of religious, philosophical or personal belief reasons. I've been a bit slow getting around to this post, so the subject is rather old news, in blogging terms. Back at the end of April and early May, the anti-vaccine world went into a tizzy about a documentary developed by chstvFILMS (Carlsbad High School Television), an award-winning broadcast journalism program run by high school students for high school students. They have a teacher adviser and a parent volunteer to help the students, but the students do the work of writing, filming, interviewing and so forth. Several years ago, the students started work on what was intended to be a short (15 minutes or so) documentary on the immune system. What they ended up with was a roughly 45-minute documentary on vaccines, the threat of infectious diseases and the role of vaccine refusal in the spread of disease: Invisible Threat. 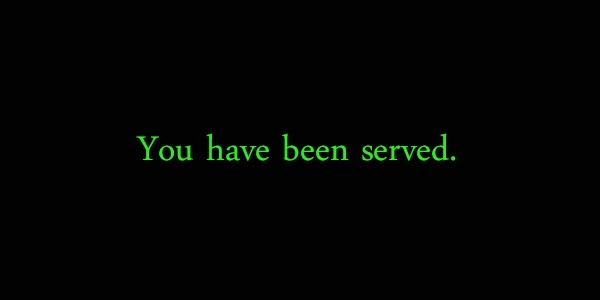 Invisible Threat Trailer from CHSTV Videos on Vimeo. This class assignment was a HOW-TO GUIDE on how to deceive the public by covering up relevant facts about a major issue...What was produced here was propaganda. This, of course, without Ms. Dachel having seen the film at all. Unlike AoA's Media Director, I wanted to actually watch the film before I made any comments on it, either for or against it. So, I contacted the film's producer Lisa Posard at InvisibleThreatInfo@gmail.com. Clearly there's something going on here. There has to be a connection. I mean, how else do you explain how closely those lines match up? It can't just be coincidence. Or at least, no more coincidence than the number of vaccines on the recommended childhood schedule and autism. I guess if we want to keep couples together in Kentucky, we need to make sure that there are as few lawyers in the Northern Mariana Islands as possible. I mean, the data's right there. This should, hopefully, illustrate how just because two things appear to be correlated, does not mean they really are, nor that there is any sort of causal connection between the two. You can even look for your own correlations by clicking on the "Discover a new correlation" link. Just pick your starting category, then your first variable and finally your second variable. You can see how close is the correlation by looking at the number in parentheses. The closer to 1, the closer the correlation. The closer to -1, the closer to an inverse correlation. Then just click on "Correlate" to see your graph. A couple weeks ago, I shared my review of this year's Northeast Conference on Science and Skepticism (review of Day 1 is here and review of Day 2 is here). While I was there, I had the opportunity to talk with Dr. Paul Offit, Chief of the Division of Infectious Diseases and the Director of the Vaccine Education Center at the Children’s Hospital of Philadelphia. 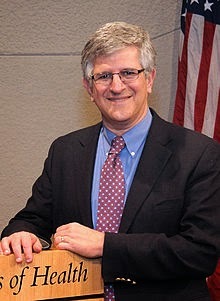 Dr. Offit is the author of a number of books, largely focusing on vaccines and the anti-vaccine movement, most notably Autism's False Prophets and Deadly Choices: How the Anti-Vaccine Movement Threatens Us All. His most recent work, Do You Believe In Magic?, which came out last year, focuses on complementary and alternative medicine. After a couple shifts around in scheduling, Dr. Offit graciously sat down with me during the lunch break on the first day of the conference. My thanks to Chris Brown and the rest of the NECSS staff for helping arrange this opportunity. The sun set long ago, and outside, the world sleeps. Only the occasional passing car breaks the tranquility of the night. Inside, a lone figure sits before a laptop. The lamp on the desk sheds a soft, if weak, light, nearly drowned out itself by the cold illumination of the monitor. The figure's fingers tap out a few final strokes, then move to the mouse. She drags the cursor across the screen and clicks "Publish". A sudden flash of lightning and thunder, then the room goes dark. There is a lot of misinformation out there about vaccines and, well, pretty much anything related to them. People like myself that take a science-based approach to vaccines to counter myths are "pharma shills" (we're not). Manufacturers have absolutely no liability (they can be sued for some liability claims). If vaccines work, it doesn't matter whether my kid is vaccinated or not (it does matter), or the variation, why do so many outbreaks include the vaccinated (it's a numbers game; see previous link). The government is scared to do a randomized, double-blind, placebo-controlled trial of the vaccine schedule (such a study would be unethical and possible illegal). VAERS is a reliable source for drawing conclusions (it's unreliable for conclusions, but can be a springboard for research ideas). Here's a clue, they aren't. The short response is: Taxpayers do not pay for vaccine court payouts. But I'll go into a bit more detail.